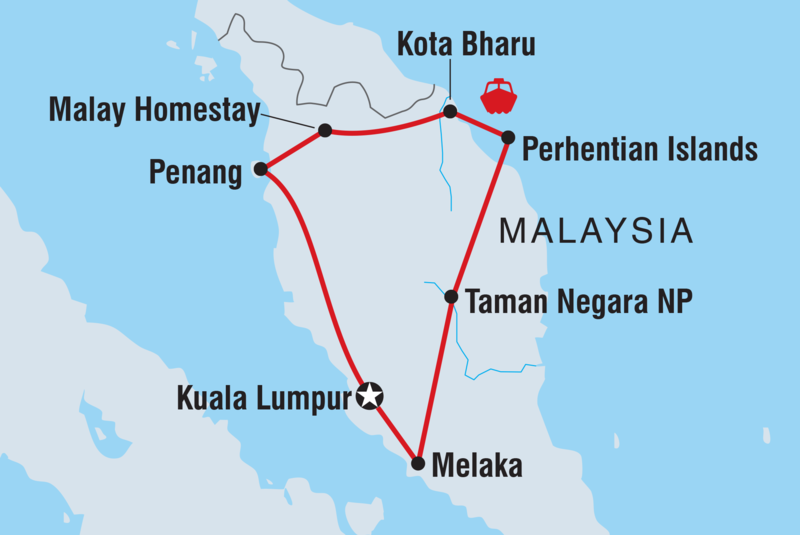 Diverse and culturally rich, this trip captures the very essence of Malaysia. From the contrasting cities of ""KL"" and Melaka, to the natural wonders of the world's oldest rainforest and the marine life around the Perhentian Islands, Malaysia has so much to offer the adventurous traveler. We visit the historic old port town of Melaka, where ancient Malay, Chinese and Nyonya traditional ways still abound and contrast with the European influence of a colonial past. The ancient rainforest of Taman Negara provides us with an opportunity to get back to nature, with a jungle trek and a night spent in a large cave. The unspoiled reefs and crystal clear waters of the Perhentian Islands invoke all kinds of peacefulness, which continues as we visit our longtime friends, Aziz and Asiah, on their island homestay just out of Kuala Kangsar.